This Speyside Single Malt overflows with cereals (malted barley) and is a light whisky and ideal appetizer. The Classic Malt Selection offers a tour of Scotland's malt whisky producing regions, each one of them expressing the typical nature of its land, through specific character and flavours. For each one of the Single Malts, spring water, soil and time work their magic and capture the essence of a land in a bottle. Founded in 1898 by John Thompson, the Knockando distillery sits on the Spey banks, the river from which Speyside takes its name. This region of Scotland is known for its refined malt whiskies. The distillery’s name derives from Gaelic “Cnoc an Dhu”, translating as “small black mountain” in English. 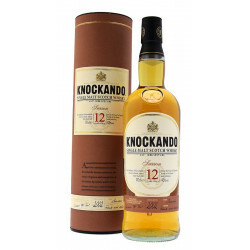 The Knockando’s tradition is to bottle whisky from a single vintage, or “season”. This harks back to the time when distillation was a seasonal activity, only done in autumn and winter months. Today, Knockando is distilled all year-round, but is still bottled “one season at a time” and each bottle proudly bears its year of distillation. The unique character of Knockando ranks the distillery in the Classic Malts Selection. Created more than 20 years ago, this selection recognises Single Malts crafted in the tradition of iconic distilleries, and offers the most impressive whisky styles Scotland has to offer. Nose: fresh, sweet and fruity with a lovely almond flavour. Palate: delicate, fresh and fruity. Citrus fruits notes and grains in the first hit, followed by hues of sweet almonds and hazelnuts. Finish: supple and creamy with toffee flavours.